Screen Mirroring is a technique, which allows you to mirror your smartphone on TV screen. You can easily access all of your games, photos, videos and other application on a big screen using Mirror Screen to TV App. 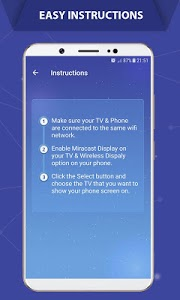 You will need to open the connection for Mirror Cast App on both your smartphone/tablet and your TV in order for the connection to work successfully. 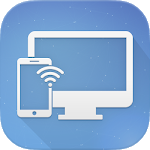 Wireless Screen Mirroring is one of the best screen mirroring apps for android users. Screen Mirroring allows you to easily connect your device and your TV. Mirror Screen to TV is simple, easy to use and free app. 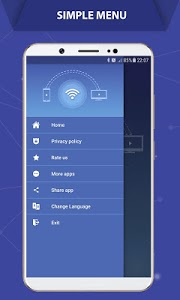 This Mirror Cast app provides you a secure connection to protect your data, files and applications. Wireless Screen Mirroring is useful for stream movies, videos, access photos and apps on TV screen. You can easily connect your smartphone with your TV wirelessly. You can easily search your favorite TV shows and series and easily stream them anytime on your TV screen. Watching videos on your TV or tablet is great. Streaming those movies for your big screen TV? Better yet. This’s the best Mirror Screen to TV app to view your phone through your TV. 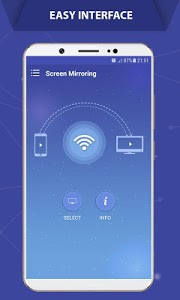 If you are searching for How to Connect Phone to TV Without Hdmi then this is the best Mirror Cast app, you will find. 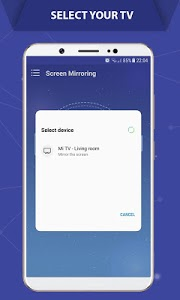 If your eyes are drained from looking at your small cellular phone, you will get a great big screen phone experience by connecting your phone to a TV screen via This Wireless Screen Mirroring app. Screen Mirroring is supported by all Android devices and Android Versions. If you face any problems with your device, feel free to contact us! PLEASE CONTACT US at [email protected] for any issue or feature request prior to leave a bad comment, we would be pleased to provide you any help!